We're officially into the holiday season! Everything in your life right now might be consumed by holiday parties, buying gifts and cozying up by the fire with a special someone... and what's wrong with that? Nothing! However if you need a break from all the festivity, may we suggest these adorable wedding photos & ideas? (Psst -- and if you like these, make sure to check out Vol. 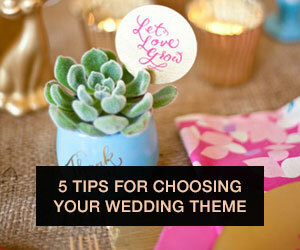 1 & 2 of Pin-worthy wedding ideas as well)! There was so much pretty wedding inspiration this week, so take a peek at a few of our favorite things and Pin your little hearts out! We couldn't get enough of this gorgeous idea from last week, with a statement floral wreath that perfectly frames romantic photos of the bride and groom. With this wreath full of beautiful leaves and pretty neutral colored blooms above, this is one trend that we hope is here to stay! Have you ever seen a side ponytail look so romantic? This bride wears a side ponytail perfectly with this gold leaf hairpiece and sweet blush gown with oodles of tulle. Yes, this really is the perfect engagement selfie! We love how the groom is included so the photo isn't just about a sparkly diamond... it's about the two of you! Is this amazing? Yes. Would it look perfect for your wedding? No doubt! Boho brides, take notes on Barefoot Blond's pretty 'do! What's more romantic than a wedding in Hawaii? A Hawaiian wedding with a gorgeous bride in a Katie May dress of course! Backless and breathtaking, this may be the perfect wedding photo! Pin your favorite -- go crazy! And stay tuned for next week's patch of certified fresh and pretty pins!